Recently Günther Simmermacher visited Havana, the capital of Cuba. In the first of two articles, he shares his impressions. My wife shot me daggers as our guide in Havana, Cuba, pointed out that we were staying in a “bad neighbourhood”. The area of Havana Centro is admittedly not a tourist haven. This is where the locals stay and the renovators haven’t yet come to. Which is one of the reasons why I had booked our apartment here, two blocks away from the Malecon seafront and within comfortable walking distance of the historic La Habana Vieja (Old City) and the more upmarket Vedado suburb. Here, where the people live, where the houses are still as run-down as the photo essays of Havana promise, where the tourists don’t come—that’s where you see and hear and smell the life of the local people. “A lot of crime,” César the guide added as Mrs S gave me a look which suggested that she was thinking hard about adding to the crime rate. Havana is largely crime-free, certainly for tourists. Local crime tends to arise from interpersonal disputes and smuggling. One reason for that is that Cuba’s one-party state has no sense of humour when it comes to crime. Even owning a marijuana joint is going to get the owner locked up for a long time. Mugging tourists, at a time when Cuba is trying to attract tourism as a major source of income, is not a great career path for the budding thug. But more importantly, Cuba’s social system makes crime driven by need unnecessary. A street in Havana Centro, “a bad neighbourhood”. In Cuba, every person receives a ration of basic foods, courtesy of the government, through a coupon system. No Cuban needs to go hungry, and if they can afford to buy more, they can do so (subject to stock). Should a doctor find that a pregnant woman is lacking certain vitamins or minerals in her diet, the mother will receive a prescription for the appropriate extra rations of food which she then picks up at a special counter at the shop. All medical care, provided by highly-trained doctors and nurses, is free and relatively easy to access (and talking of training medics, Cuba is currently training 3500 South Africans to become doctors). Cuba’s infant mortality rates are among the lowest in the world. And thanks to free education, up to whatever level you can or want to achieve, adult literacy is among the highest in the world. Cubans are taken care of in retirement, too. So, what need is there for crime, unless for avarice? But that might come yet as a new middle class with imported cars and big TVs is emerging, thanks to the proliferating tourism industry. In a land where a doctor earns only $64 a month, a tour guide or a taxi driver can make that in a day or two. That might breed envy and a new preoccupation with material aspiration. The threat of a culture of decadence becomes ever closer as the opening of borders with the United States becomes inevitable. The borders were slammed closed by US President Donald Trump after they had been unlocked by President Barack Obama, through the mediation of Pope Francis, just a couple of years earlier. But it is only a matter of time before they will open again. Already US tourists are finding their way to Havana, along with ceaseless streams of cruise ships from around the world. Cuba is embracing the tourism industry, and the government now permits small private enterprises, such as bars and restaurants, tourist guiding, taxis and so on. Women in Cathedral Square in Havana’s Old City. The famous 1950s convertibles are now all gleaming taxis. Most of these street cruisers are restored with innovation: a 1952 Chevrolet may drive on a Toyota engine and be steered with a Lada wheel. It’s the Cuban way to make a plan. At the same time, it seems to me that most Cubans are serene about their material deprivations because they are so rich in spirit, something that finds expression in a vibrant cultural life which fills the streets with music, the bars with dancing, and deprived neighbourhoods with art projects. The basic needs of the Cuban people are taken care of by the state, and in a culture of little accumulation, there’s lower stress (unless you issue opinions which the regime doesn’t like, of course). Instead, there seems to be an ingrained sense of solidarity across society which suggests that there is no huge appetite for toppling the regime — though there is a general cautiously expressed desire to make it more competent and less corrupt. That mindset doubtless is the result of communist socialisation. It is also a profoundly Christian attitude. And that is one of the great ironies: the communist regime that feeds the multitudes and fosters solidarity with the poor has a history of persecuting Christians, the people whose Lord fed the multitudes and urged solidarity with the poor. Revolution Square with the images of revolutionaries Che Guevara and Camilo Cienfuegos; it has been used to hold three papal Masses. After the revolution 60 years ago, the regime of Fidel Castro drove the clergy out of the churches and into exile or re-education camps, while the faithful were made to feel the disadvantages of being associated with the enemy of the state. Things weren’t quite as bad as they were in other communist countries, but the persecution eased only in the 1980s, and matters became increasingly better with the visit by Pope John Paul II in 1998. 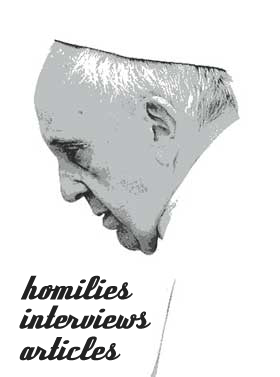 It helped that in some ways, the pope spoke the language of the revolution. As the massive steel memorial of Che Guevara loomed over the papal Mass in the huge Plaza de la Revolución, the decidedly anti-communist pope used the language Fidel Castro might have applied in his rambling speeches. That first, groundbreaking papal visit, coming at a difficult economic time for Cuba, was preceded a couple of months earlier by the declaration of Christmas as a public holiday. In 2012, to mark Pope Benedict XVI’s visit, Cuba declared Good Friday a public holiday. So papal visits seem to remind the communists of their country’s Catholic traditions. But it wasn’t always like that. It seemed churlish of Castro to turn against the Church which had educated him, at the Jesuit Belen College — which he later closed. Indeed, without the intervention of Pope Pius XII, Castro would not have been released from jail under Fulgencio Batista’s brutal and thoroughly corrupt regime, enabling him to flee to Mexico where he would meet the Argentine revolutionary Che Guevara. As so often, the persecution of the Church was driven more by political expedient — the Catholic Church opposed communism, and vice versa — than by hatred of the faith itself, though the former always feeds the latter. Today, relations between the Church and the regime are good. In the week before our arrival in late January, Cuba’s first new Catholic church since the revolution was opened in the city of Sandino. It is almost like the regime is seeking to return to the Church. Welcoming Pope Francis in 2015, then-President Raúl Castro, Fidel’s brother and also a leading revolutionary, publicly mused about becoming a Catholic again. And Fidel, wearing the triple-striped tracksuit of an imperialist sports goods manufacturer, was holding the hand of the pope — the head of the erstwhile “Enemy of the Revolution”. A Pick of Top 10 Churches St Maximilian: Martyr, Missionary, Media Man With God on the Football Pitch Was Jesus Black? Previous story Sacred Heart Parish in Durban Prayer Day on the Beach!